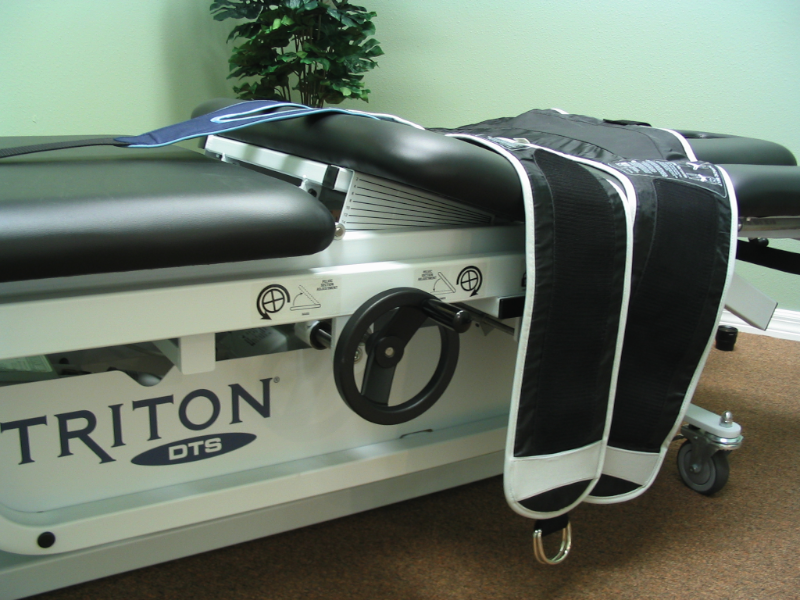 The Triton DTS Traction device provides a treatment in static, intermittent, progressive, and cycling distraction forces to relieve pressures on structures that may be causing pain of skeletal or muscular origin (cervical, thoracic, lumbar spine). It is designed to closely replicate the hands of a therapist providing manual traction over a prolonged period of time. Therapeutic distraction can be applied in a variety of programmable patterns, cycles and functions. Please watch the video above to learn more about the Triton DTS. Is spinal decompression traction covered by my health insurance? Yes, in many cases traction therapy is covered by your health insurance under code 97012 (mechanical traction). If your insurance does not cover mechanical traction, the cost for this treatment alone is $50. We cannot accept payments in advance for this treatment or offer a "package" of treatments at a discounted rate as this treatment is offered only when it is recommended by your therapist and/or prescribed by your doctor as a medically necessary component of your plan of care. Is there any difference between the treatments advertised as "spinal decompression", or "spinal decompression traction"? No, decompression of the spinal column is one of the desired outcomes of mechanical traction. Most clinics that advertise non-surgical "spinal decompression" attempt to achieve decompression of the spine through a device that provides mechanical traction as defined by the Centers for Medicare and Medicaid Services (CMS) and other insurance companies. Spinal decompression traction is not the same as surgical spinal decompression which is performed by a board certified surgeon. Spinal decompression surgeries include: diskectomy, laminectomy, foraminectomy, and osteophyte removal. We use the word spinal decompression traction to clearly indicate to the patient that we utilize non-surgical mechanical traction to distract the spinal column. Spinal decompression traction is not an alternative to spinal decompression surgery when it is recommended by an orthopedic surgeon, but many surgeons or pain management physicians may order mechanical traction therapy along with physical therapy if they determine that it may help avoid back or neck surgery or as an alternative to pain medications for certain patients. 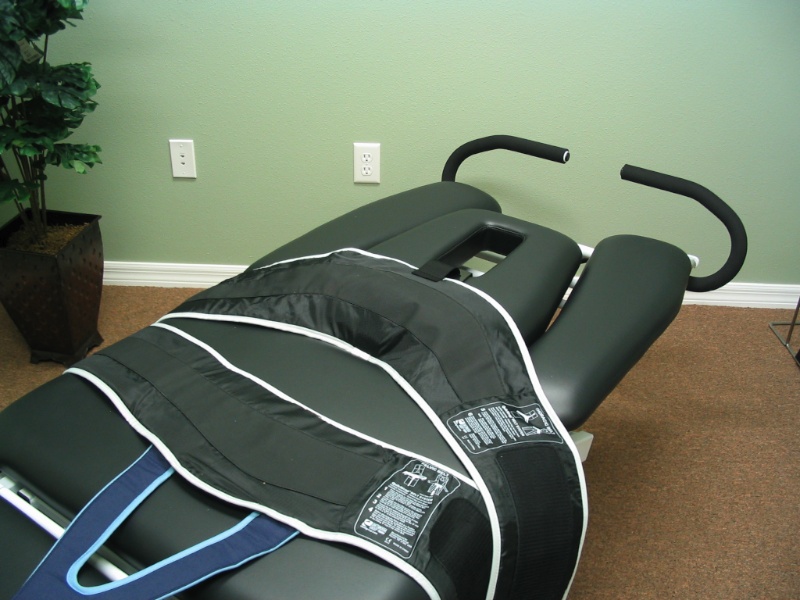 If all spinal decompression traction systems are essentially alike, why should I choose to go to Brookline Physical Therapy for Spinal Decompression Traction Therapy? For one, as you can see our self-pay fee is extremely low for spinal decompression or we are usually able to bill it through your insurance which cans save you hundreds if not thousands of dollars for essentially the same treatment at other "spinal decompression" centers. More importantly, as a modern and fully equipped physical therapy clinic, Brookline Physical Therapy has the capability to provide high quality physical therapy and ongoing assessment to coincide with spinal decompression traction. Many clinicians agree that this is the "best practice" approach. (See video above for more info). When comparing spinal decompression traction centers it is important for the patient to evaluate the quality of the therapists and facility to provide quality rehabilitation during or after spinal decompression traction. Mechanical traction has been performed for decades by therapists as an adjunct to therapeutic exercises. Unfortunately such a simple device has been marketed in recent years as a panacea for spine pain. For certain, mechanical traction can play an important role in your recovery, but it is not the right treatment for everybody and you certainly shouldn't be overpaying for it. What specific approach do you take in treating back pain? At Brookline Physical Therapy we utilize a classification systems approach to determine which treatment would be most effective for your back pain. With a prescription from your doctor we may recommend to perform AROM mobilization exercises, initiate spinal stabilization exercises, initiate specific flexion, extension, or lateral shift exercises, or begin a combination of extension oriented exercises in addition to spinal decompression traction. With certain conditions we may also recommend a referral for chiropractic manipulation. Our physical therapists received specific training on the McKenzie treatment exercises at the McKenzie Institute which ongoing research is showing to be an effective technique in combination with mechanical traction for patients suffering from certain nerve root compression pathologies such as sciatica. We do not subscribe to the belief that there is one "best" approach or one best treatment modality to address back pain, but rather it is up to the physical therapist and your doctor to determine the most effective treatment for the patient based on proper classification. We will only recommend spinal decompression traction in your plan of care if it is appropriate for you following a thorough exam and a classification of your symptoms. If it is determined that spinal decompression traction can help me how many treatment sessions will be necessary? If spinal decompression traction is indicated we begin with up to 6 sessions at 3 times for 2 weeks to see if it is an effective treatment for you in combination with therapeutic exercise. If you are not showing continued progress after 6 visits we may stop decompression traction altogether but continue to progress extension exercises, attempt another physical therapy approach, or we may refer you back to your physician. 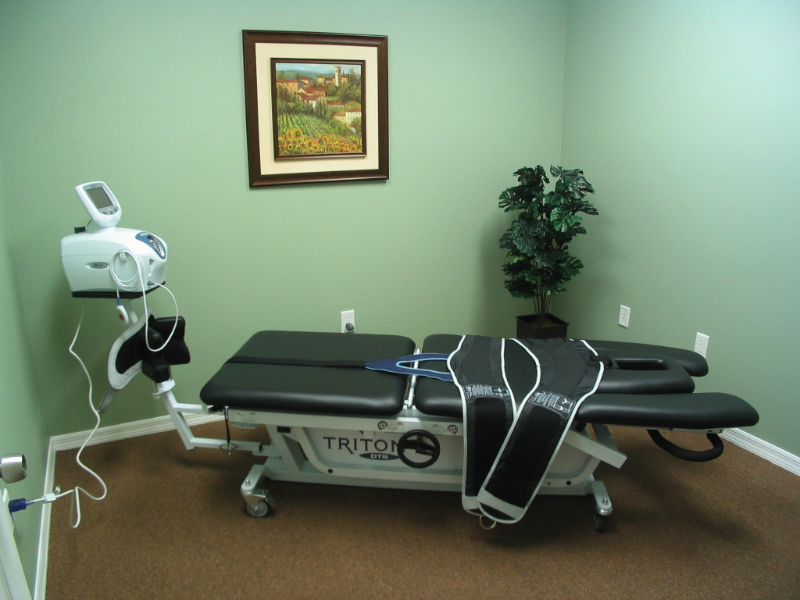 Spinal decompression traction is not a replacement for good medical advice which may include pain management, physical therapy intervention or a possible surgical consultation with an orthopedic surgeon, neurologist, or neurosurgeon . Yet following a medical consultation with your doctor, we believe it can be used in conjunction with physical therapy, traditional medical approaches, and/or other medical options to achieve excellent results and it can sometimes even help to avoid surgery. We work alongside your family physician, internist, pain management doctor, neurosurgeon, and orthopedist in deciding what is the best approach to help you manage your neck and back pain and and we always do what is in your best interest. 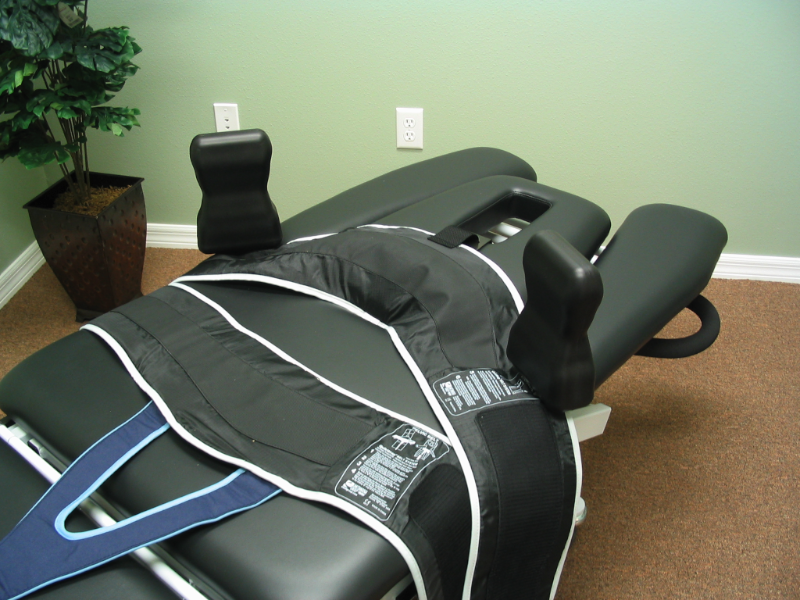 What are some of the contraindications to Spinal Decompression Traction? Patients spinal surgery involving metal plates, screws, or "cages"
If you are uncertain if you are a good candidate for spinal decompression traction please call us at (813) 527-6913 for a consultation.
" When I came in for my back pain, my pain was from 1-10 a 9. I was hurting pretty bad. After a few times on the Triton DTS it really helped. My back pains are gone. I am happy with the way I feel now. Thank you guys for all the help. "